This SystemIs So Valuable It's Like Having The Ability To Print Money! - And Now You're Going To Learn How! In this 15:53 video, you will learn how to make money online with no out-of-pocket expenses. In this 28:06 video, you will learn about profitable niche markets and how to find the most lucrative niches. In this 10:23 video you will learn how to become an affiliate and the steps in promoting a product. In this 20:26 video, find out what kind of preparation is needed to start making money with Affiliate Marketing. In this 6:57 video, discover what auto responders are and how they help your affiliate sites run smoother. Create a free https://www.tradebit.com account to help run your website while you are working on other projects. In this 12:53 video, find out how to set up, post on, and edit your Weebly website. Check your sites links to make sure everything functions properly. In this 14:26 video, see what you need to do in order for you website to look clean and professional. In this 26:04, you will create a free report to give away in order to get email addresses onto your list. Use existing articles to create a report of your affiliate product that will act as a legal bribe. In this 3:26 video, learn how to upload your pdf file for use in your auto-response email. In this 22:09 video, you will set up your listwire auto-responder and integrate your free report with listwire. Listwire is a free and easy way to increase the efficiency of your affiliate website by using Listwires auto-responder. In this 12:43 video, find out how to make your affiliate website bring in traffic. In this 20:07 video, check out buddy marks and find out how to best use it to increase traffic for your affiliate site. Use a content rich internal link to ensure that your link is not taken down. The more social bookmarking sites you utilize, the more exposure your affiliate site will receive . Social Bookmarking is an excellent method of increasing traffic to your affiliate site. In this 21:12 video, you will be shown step by step how to best utilize article marketing to increase traffic to your affiliate website. Submit your content articles to article directories that will host and link back to your affiliate site. Create an author bio that will make you stand out among other authors and add to your professional image. Article directories may take a few to several days before you content is reviewed and posted. In this 14:37 video, explore the concept of blog commenting and how to utilize this method of promotion to increase traffic to your affiliate website. Spam comments will not help increase your traffic; post only quality comments to lure in more traffic while also adding to the community of your product. Find niche blogs that are closely related to your product, this greatly increases the chance the links in your comment will be clicked. In this 25:26 video, you will find out how to best utilize squid lenses to increase traffic to your affiliate website. Squidoo is a versatile website in that you can use it for any type of product you would like to be an affiliate for. Fill your squidoo with keywords that will increase your google ranking which will bring more traffic to your affiliate website. Make sure your articles are unique and well written to help them stand out and draw more traffic to your affiliate website. In this 23:57 video, squidoo's many different modules will be explained to you so that they can be utilized. Poll modules can be used to research your niche more and get users involved, which help add to your professional image. Include your affiliate links in your text modules as well as other useful links to improve the quality of your posts. Adding popular videos related to your niche is an effective way to increase your traffic. In this 26:57 video, find out how to utilize web 2.0 sites to drive traffic through your affiliate website. Web 2.0 sites allow users to post their own content and host the content for free. Include keywords in your web 2.0 site name that will rank you higher on google. Customize your web 2.0 site to add legitimacy and give your site a professional feel. In this 16:37, you will learn how to create a video that you can post to youtube. When utilized correctly, this method will drastically increase the traffic going through your affiliate site. The method used here is completely free and can be used on both windows and Mac computers. Utilize articles you already have to create a powerpoint presentation that will draw more traffic to your sites. In this 11:48 video, see how to clean up your powerpoint presentation so that you can post it to youtube and other video sites. Adding animations to your presentation will increase the perceived quality of your video, which will draw more traffic through your affiliate website. Ensure that your presentation is in the correct order and functions properly. Use a screen capture software to record your presentation, creating a youtube ready video. In this 6:09 video, find out how to submit your product related video to youtube. Youtube puts a large focus on tags, keywords, which makes this method perfect for niche markets. In this 7:29 video, see how to upload your slideshow presentation to file sharing websites. Posting your video content to high traffic slide sharing sites is a great way of increasing exposure and traffic. Include your niche market keywords when uploading your video to draw more traffic through your slideshow and onto your affiliate website. There are many different pdf sharing websites that you can post to, submit to any that will take your content. In this 10:12 video, you will learn how to get more traffic using wiki dot and how to find other wiki sites to promote and link back to your content. Wiki sites are user driven, much like web 2.0 sites. Your wiki dot site can be quickly and easily updated with any new content you produce. Post articles with keywords and links to give your wiki dot a professional appearance. In this 1:21 video, find many other sites that function much like WikiDot. All of these websites are easily found by going to google and doing a search for "Sites like WikiDot." After finding what other sites are out there, post to as many as you can. The more pages with your links in them, the more traffic your affiliate site will receive. In this 6:39 video, find out what you can do to get your websites indexed by pinging them with multiple mass-pinging websites. Pinging your homepage as well as internal links is an effective way of promoting your content. Add your niche market keywords to your pings to increase the chance. Submit your blog's RSS feed to as many ping sites as you can find. In this 6:15 video, you will see how to create a free blog for your affiliate product. Blogger combined with effective niche market keywords will increase your affiliate website's traffic greatly. Post articles with keywords incorporated into them as well as your affiliate link and any other useful links that will create a more professional appearance and increase traffic to your affiliate website. Blogs are a quick and easy way to spread word about your content. In this 4:12 video, see how to visually customize your blog and add gadgets to increase the perceived quality of your content. Organize your gadgets to increase traffic to your affiliate website. Include your video content in a blog post to add more traffic funnels. Link up content with backlinks and update your blog with keyword rich posts. In this 6:00 video, find out how to create a press release for your content. Press releases discuss any new events that you want to announce to the general public. Include keywords in Press Release title that grabs attention. When writing a press release, include links to your website and describe the features offered on your affiliate website. In this 9:05 video, quickly learn how to submit your press release and other press release websites. Use niche market keywords in your headline and summary for your press release. Copy and paste your press release into the submit form, making sure to include your affiliate website links. Add niche market keyword tags to your press release. In this 4:27 video, learn about a method to grab new traffic by guest blogging for a similar niche blog. Create a high quality article for a similar niche market blog that will include ever-useful back links to your affiliate website. Search for guest blog opportunities using google and pursue any opportunities in your niche market. Submitting guest blog articles can be a somewhat time consuming process but you only need to submit a small amount of articles for this method to be useful. In this 3:10 video, find out how to use forum signatures to promote your content. The perk of using this method is that any post you make on that forum links back to your affiliate website. Post questions and helpful replies to increase the amount of places your signature links will be seen. Some sites require a certain amount of posts before you can create a forum signature. Use forums closely related to your niche market to increase the effectiveness of this method. The tutorial series is wrapped up in this 1:12 video. Proper utilization of these methods will yield successful results. Take time everyday to work on new content for your affiliate website. In this 4:03 video, see how to send out a List Wire broadcast to your email list. Using this method you can keep your affiliate link fresh in your subscribers minds. Keep your broadcast simple but effective by making them short and too the point including your affiliate link. Send broadcasts at reasonable intervals, do not spam your subscribers. In this 2:53 video, you will see how the long term strategy works and advice on how to improve your affiliate marketing. 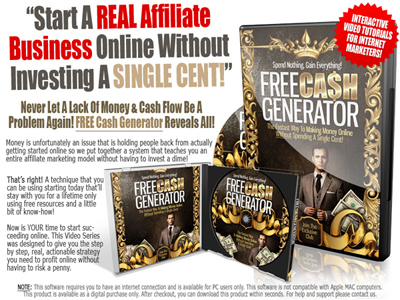 Invest money made from affiliate marketing back into your operation. Once you have started making money, don't stop working on expanding where your content can be found. Never stop generating more traffic.